A really smart guy once said, "The true call of a Christian is not to do extraordinary things, but to do ordinary things in an extraordinary way." We're thinking that he must've met Caleb Rowden already. Caleb is an ordinary guy. A kind of Everyman who wakes up, puts his pants on, eats breakfast, kisses his wife and goes about his day. He's a sports enthusiast who tries to be a good neighbor, a responsible driver and a loyal friend. Where the ordinary meets the extraordinary may not seem so obvious. But the fact that this 23 year-old Columbia, Mo., native played his first church gig at the age of three and has been keeping the beat ever since is a big hint. The fact that for the past decade he's been building a highly successful career as an independent-opening for such notable talents as MercyMe, Casting Crowns, Nichole Nordeman, Jeremy Camp and Audio Adrenaline-might make this ordinary guy a bit more intriguing. But consider the fact that, even before his career got off the ground, Caleb Rowden put his money where his passion is, establishing a non-profit organization to support ongoing mission efforts, and you're getting even closer to understanding how special this guy really is. "I was raised to be in the church every time the doors were open," explains Caleb. "I was always very involved in youth group, and that really helped shape my calling into ministry. I had two different youth pastors who were great mentors in my life. Their doors were always open, and we had a lot of late-night talks. I think all of that has definitely helped bring me to where I am. A serious drumming talent by the age of three, Caleb grew up in a home where southern Gospel music provided the sonic wallpaper. By 13, he had added guitar, keyboards and songwriting to his repertoire and joined a band, Wisdom's Cry. Juggling high school and more than 100 gigs a year took its toll, but as good drummers do, Caleb provided a steady backbone, all the while developing his craft. When Wisdom's Cry disbanded in 2005, the group's primary songwriter was ready for an extraordinary solo adventure. Inspired by music he enjoys today-artists like Switchfoot, U2, Keane, David Crowder Band and Coldplay, among others-FREE FROM ORDINARY excels by seamlessly blending spirited pop/rock songs with worshipful, Christ-centered songs of praise. 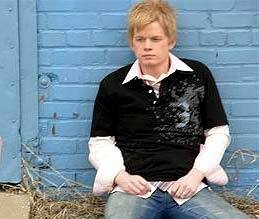 The project was produced by Dan Needham (Steven Curtis Chapman, Stacie Orrico) and Kevan Cyka (REM, Hilary Duff), with Caleb co-writing all of the album's 10 tracks. "More than anything, I want my songs to be relevant to my generation, to say it's OK to believe in God and be culturally relevant and cool," Caleb explains. The project's cornerstone is "Alone," a passionate description of hope built on aggressive guitars and soaring vocals. Although he frequently plays churches, Caleb wrote the track with seekers in mind. Beyond the obvious evangelical nature of the song, Caleb appreciates how the song pulls double duty since it stands abundantly pertinent to believers, too. "'Alone' is relevant to somebody who has been a Christian for a long time, people who, like me, need be reminded about those things we risk taking for granted." "You Are Holy," the record's first single, celebrates God's majesty and peace. "This was one of the first songs I wrote when I started doing solo work," he explains. "I always have an objective when I sit down to write, and the goal for this one was to create a cool worship song that could be sung corporately or individually." With a little help from producers Needham and Cyka, along with studio pros like George Cocchini (guitars), Mark Hill (bass), John Catchings (cello) and Needham (drums, keys, guitars), the result was not only a phenomenal worship classic-in-the-making, but also an inspiring sonic feast. The clear, worshipful tone of FREE FROM ORDINARY is unmistakable, but Caleb is careful to point out his work generally stands apart the worship trends of the day. "I definitely love to lead worship, and I do it somewhat frequently. But I wouldn't call myself a worship artist," he says. Instead, Caleb hopes these songs will be uplifting to listeners' walk with God and relevant to life as we experience it. He illustrates this perspective while talking about "The Journey." "That was definitely kind of a theme song as I've been transitioning into this solo thing," which, he says, had its usual growing pains. "We are all on a journey, and these songs are meant to encourage and remind each of us of one idea: That God is with us-no matter what we may be going through. And as Christians, we have to believe that in the end, God is going to use this road, these situations, to make us better, stronger people." Talking with Caleb, it's abundantly clear he's grateful for the opportunity to pursue his musical passions. As a way to give back to God and the people who make that possible, he helped establish Wisdom's Cry Ministries. Each year, Caleb and the ministry's board of directors choose a mission organization to assist, and a portion of all the proceeds from Caleb's music supports those chosen. This year, WCM supports missionaries in Bulgaria and India, as well as the Sunshine Children's Center in Kiev, Ukraine. "Over 140,000 children live homeless on the streets of Kiev," Caleb says, "and Sunshine has created a home where children can find help and hope for the future. It's such an extraordinary thing to be able to help our friends who are reaching out to the poor. It's as much a part of my calling as anything else I do."